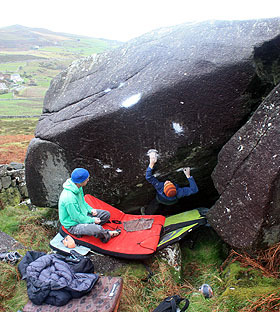 Yesterday Pete Robins climbed a powerful new line on Mynydd y Graig, the dolerite outcrop above the village of Rhiw, close to Porth Ysgo on the Lleyn Peninsula. 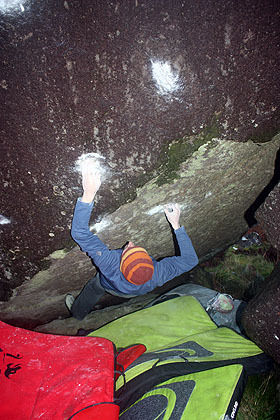 Underpants 7B fires straight up through the slopey lip traverse, Pant’s Traverse, a superb but undocumented 6C first climbed by Si Panton in 1997. 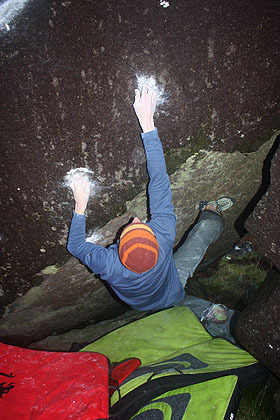 The new problem starts matched on a pair of crimpy edges with feet on a low ledge. 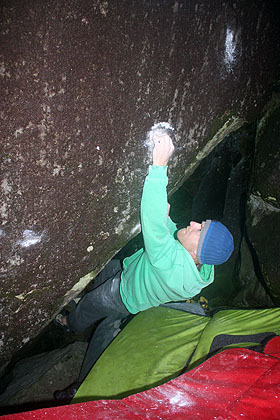 A series of burly moves on small holds leads to a slopey mantel finish. The boulder can be found just left of centre at the point close to where the drystone wall meets the crag.